Privately Owned-Saturday to Saturday vacation rental. Book direct through the owner! NEW September 2017-Living room couch,love seat, leather recline chair, mattresses & deck furniture!! WIRELESS INTERNET!! Built in 1997 (It has been said that staying in our home is the most Relaxing vacation you will ever take!) Beautiful 3 BR, Master = queen, other bedroom = 2 twin beds, last bedroom = 2 sets of bunk beds), 2.5 Bath Home is has a very open living space on the top floor with a cathedral ceiling & lots of windows, most with Ocean View. Complete, modern kitchen with all amenities, including dishwasher & microwave. Kids Beach toys for guest use. 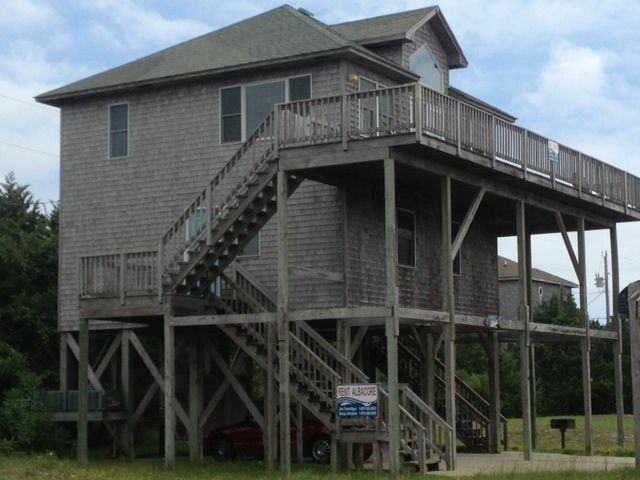 Huge wrap around deck, with Ocean & Sound views! 325 Yards from Ocean! All Amenities of Home. 7 Miles south of the famous Cape Hatteras Lighthouse.
! Note: you must be at least 25 yrs of age or older to book this house! Close to Fishing Marinas, Restaurants and Shopping! shopping and restaurants within 5 miles from the house. Very Quiet dead end Road to the beach- With Only 5 Homes. We started coming to Frisco in 1988 & fell in love with the laid back life style & the beautiful uncrowded beaches! Finally in 2001 our dream came true & we purchased Albacore!! We absolutely love this beach house & know you will too! Jim & Joyce Terwilliger and Doug & Judy Johnston Owners. It has been said, that staying at Albacore is the most relaxing vacation you'll ever take!! Our house is 325 yards from the dunes, a short 5 min walk. Beautiful Ocean View from upstairs living quarters & from the huge wrap around deck!! Great kitchen with many utensils, pots & pans including 2 steamer pots, 1 little & 1 bigger. Outer Banks, North Carolina. Centrally located within 15 minutes from Ferry & Ferry Plaza Shopping Center.! 15 Min. from Big Food Lion Grocery Store. Some of the best fishing & wind surfing in the United States!! Other Activities: Full size basketball hoop & backboard on concrete driveway. Lots of books,Dvds & games!